Record-breaking astronaut, national hero, and bestselling author of Endurance Scott Kelly comes to The Music Hall as part of its Innovation + Leadership series on Sunday, Nov. 4. Scott will share awe-inspiring photos from his book INFINITE WONDER documenting his year in space on the big screen in the Historic Theater. At this 7 p.m. event, Kelly will also discuss his remarkable experience as shared in his memoir, Endurance, with Music Hall Executive Director Patricia Lynch, who will also facilitate audience Q+A. When/Where: Sunday, Nov. 4 – 7 p.m.
Tickets: Tickets for Innovation + Leadership: Scott Kelly: A Year in Space, a Lifetime of Discovery on Sunday, Nov. 4, at 7 p.m. are $13.75. For each 1-2 tickets sold, the purchase of a book voucher ($40 hardcover) is required. Vouchers can be redeemed on the event night for signed copies of INFINITE WONDER: An Astronaut’s Photographs from a Year in Space. Purchase an additional voucher for Kelly’s memoir, Endurance ($16.95 paperback), and meet the author post-show backstage, where he will be personalizing books. All seats are General Admission. Packages can be purchased online at TheMusicHall.org, over the phone at 603.436.2400, or in person at the B2W Box Office at the Historic Theater, 28 Chestnut Street. 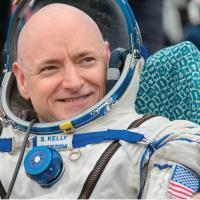 About the Author: Scott Kelly is a former U.S. Navy fighter pilot, test pilot, and NASA astronaut. Kelly retired from the Navy at the rank of captain after twenty-five years of service. A veteran of four space flights, Kelly commanded the space shuttle Endeavour in 2007 and twice commanded the International Space Station. He has logged more than 520 days in space on four space flights and currently holds the records for total time in space and for single-mission endurance by a U.S. astronaut. Kelly spent 340 consecutive days in space, launching in March 2015 and returning home in March 2016. He currently resides in Houston, Texas.